According to the leaked medical records, Hillary Clinton allegedly suffers from Complex Partial Seizures and Subcortical Vascular Dementia. Included as symptoms Clinton is experiencing are blackouts, uncontrollable twitching and memory issues. While the general consensus is the leaked medical records are fake, there is a bit of truth behind them. 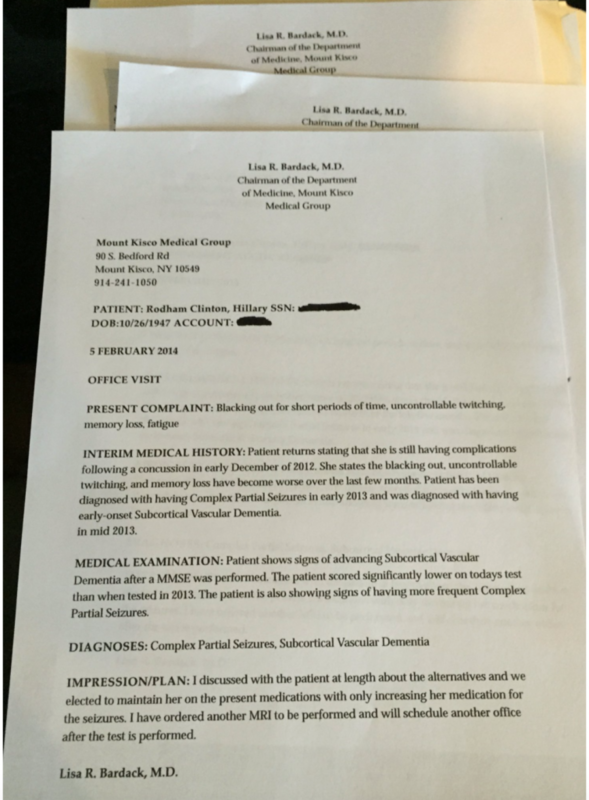 The doctor named on the medical reports has been confirmed as one of Hillary’s doctors: Lisa R. Bardack. Still, not everyone is convinced the medical records are fake. The following is a CBS News report from December 2013 reporting on Clinton’s health issues from 2012. Mentioned are two blood clots Clinton has been diagnosed with. One clot Clinton suffered in the ’90s. The other blood clot she was diagnosed with was in Dec. 2012. In a ABC News report, it was discussed that Hillary Clinton did have additional issues stemming from the concussion. No one in Hillary Clinton’s camp would state what the additional issues or injuries she sustained were. The article below should be read with caution. Hillary Clinton’s medical records have been leaked to the public and they are devastating. According to her Doctor, Mrs. Clinton suffers from “Dementia, Seizures and Black-outs.” In fact, the Doctor made note that Clinton’s conditions are “considerably worse” than in 2013. Subcortical Vascular Dementia. Subcortical vascular dementia, also called Binswanger’s disease, is caused by widespread, microscopic areas of damage to the brain resulting from the thickening and narrowing (atherosclerosis) of arteries that supply blood to the subcortical areas of the brain. Binswanger’s disease (BD), also called subcortical vascular dementia, is a type of dementia caused by widespread, microscopic areas of damage to the deep layers of white matter in the brain. The damage is the result of the thickening and narrowing (atherosclerosis) of arteries that feed the subcortical areas of the brain. Atherosclerosis (commonly known as “hardening of the arteries”) is a systemic process that affects blood vessels throughout the body. It begins late in the fourth decade of life and increases in severity with age. As the arteries become more and more narrowed, the blood supplied by those arteries decreases and brain tissue dies. A characteristic pattern of BD-damaged brain tissue can be seen with modern brain imaging techniques such as CT scans or magnetic resonance imaging (MRI). The symptoms associated with BD are related to the disruption of subcortical neural circuits that control what neuroscientists call executive cognitive functioning: short-term memory, organization, mood, the regulation of attention, the ability to act or make decisions, and appropriate behavior. The most characteristic feature of BD is psychomotor slowness – an increase in the length of time it takes, for example, for the fingers to turn the thought of a letter into the shape of a letter on a piece of paper. Other symptoms include forgetfulness (but not as severe as the forgetfulness of Alzheimer’s disease), changes in speech, an unsteady gait, clumsiness or frequent falls, changes in personality or mood (most likely in the form of apathy, irritability, and depression), and urinary symptoms that aren’t caused by urological disease. Brain imaging, which reveals the characteristic brain lesions of BD, is essential for a positive diagnosis. There is no specific course of treatment for BD. Treatment is symptomatic. People with depression or anxiety may require antidepressant medications such as the serotonin-specific reuptake inhibitors (SSRI) sertraline or citalopram. Atypical antipsychotic drugs, such as risperidone and olanzapine, can be useful in individuals with agitation and disruptive behavior. Recent drug trials with the drug memantine have shown improved cognition and stabilization of global functioning and behavior. The successful management of hypertension and diabetes can slow the progression of atherosclerosis, and subsequently slow the progress of BD. Because there is no cure, the besttreatment is preventive, early in the adult years, by controlling risk factors such as hypertension,diabetes, and smoking. BD is a progressive disease; there is no cure. Changes may be sudden or gradual and then progress in a stepwise manner. BD can often coexist with Alzheimer’s disease. Behaviors that slow the progression of high blood pressure, diabetes, and atherosclerosis — such as eating a healthy dietand keeping healthy wake/sleep schedules, exercising, and not smoking or drinking too much alcohol — can also slow the progression of BD. The National Institute of Neurological Disorders and Stroke (NINDS) conducts research related to BD in its laboratories at the National Institutes of Health (NIH), and also supports additional research through grants to major medical institutions across the country. Much of this research focuses on finding better ways to prevent, treat, and ultimately cure neurological disorders, such as BD. Where does this Leave the Election? No rational person could vote such a sickly individual into the most important political office in the world. To do so would be utterly irresponsible; even outright reckless. Look, it’s not Hillary’s fault that she’s sick. She didn’t intend to get this way, but she is, in fact, this way. It’s sad. I do not wish these health problems on her or upon anyone. But the fact is, these health problems flatly disqualify Mrs. Clinton from being President. We cannot have a person with Dementia with her finger on the nuclear button.